All available evidence suggests that extending British bombing operations against ISIS will increase the danger we face, not diminish it. David Cameron has just put a motion before the House of Commons seeking authorisation for British bombing of IS in Syria as well as Iraq. In the wake of the IS atrocities in Paris on 13 November 2015, he now believes that he can persuade a majority of MPs to vote for this step. After the IS inspired killing of 38 tourists (30 of them British) on a beach in Tunisia on 26 June 2015, he contemplated seeking parliamentary approval for extending bombing to Syria, but having tested the water thought better of it. But the IS outrage in Paris has given him an opportunity to bounce the House of Commons into approving it. It is as if he is unaware of the recent experience of France, which has been bombing IS in Iraq since September 2014 and started bombing IS in Syria in September 2015. It isn’t obvious that this extension of bombing operations has made France safer from IS. "There are always risks in war but there is a greater risk from not doing something about Isil and leaving our streets vulnerable to the kind of slaughter we saw in Paris." So, in order to prevent our streets being visited by the kind of slaughter we saw in Paris, the Defence Secretary proposes that Britain follow in France’s footsteps on the grounds that it will make Britain safer from IS. This would be laughable if people’s lives weren’t at stake. Without the action by France against IS in Iraq and Syria, it is very unlikely that 130 people would have been slaughtered by IS in Paris on 13 November. And without the Russian military intervention in Syria in support of President Assad, the 224 passengers of the Russian airliner brought down over the Sinai desert would have got home to Russia safely. IS has a proven ability to carry out its threats with murderous effect. The IS threat to Britain and to British citizens abroad will be increased by Britain extending its bombing to Syria. The simple truth is that IS will seek to respond by killing Britons, wherever they can find them. Of course, they may not be successful: in Britain itself the police and security services may be able to thwart any attack – David Cameron told the House of Commons that “security services have disrupted no fewer than seven terrorist plots to attack the UK, every one of which was either linked to ISIL or inspired by its propaganda”. But it is much more difficult to protect British citizens abroad from attack by IS. Before the beach massacre in Tunisia, in March 2015 22 people (20 of them foreign tourists) were killed in an IS inspired attack on the Bardo National Museum in Tunis. (Seifeddine Rezgui, the individual responsible for the Sousse attack, was trained in Libya. That would not have occurred had President Gaddafi been in power in Libya. President Sarkozy was the prime mover in his overthrow, which has brought chaos to Libya and helped to destabilise large parts of North Africa. But the overthrow would not have happened without the enthusiastic support of David Cameron. The Tunisian Prime Minister, Habib Essid, told The Independent on 5 August 2015 that “the UK is partly to blame for creating the violent chaos that allowed the extreme Islamist movement to flourish in neighbouring Libya”. That cannot be denied. Almost without exception, British politicians who were responsible for the military interventions in the Muslim world in the 21st century (and those who support more today) have refused to acknowledge that there has been blowback, that past interventions have increased the threat to Britons at home and abroad from al-Qaida related organisations – and British civilians have died as a result. They ask us to believe that it was just bad luck Britain became a target for al-Qaida linked terrorism and Sweden did not. In some quarters, it is regarded as close to treason to say that, as a result of British participation in the invasion of Iraq, there was an upsurge in al-Qaida linked plots in Britain, including one which led to the deaths of 52 people and injuries to over 700 others in London on 7 July 2005. Yet unimpeachable evidence to that effect was given to the Chilcot inquiry by Baroness Eliza Manningham-Buller, the head of MI5 at the time. Asked “to what extent did the conflict in Iraq exacerbate the overall threat that your service and your fellow services were having to deal with from international terrorism?” in the years after the conflict began in 2003. She replied: “Substantially”, and went on to say that there was hard evidence for this, for instance “numerical evidence of the number of plots, the number of leads, the number of people identified, and the correlation of that to Iraq and statements of people as to why they were involved, the discussions between them as to what they were doing”. There he deliberately misled the Today audience – he is well aware that the link is well-established between the invasion of Iraq and the terrorist threat to Britain, and has been described in detail to the Chilcot inquiry by the head of MI5 at the time. But he couldn’t say that lest listeners infer that what David Cameron was proposing might also increase the terrorist threat to Britain. He ended his answer by saying that “the threat is high now and I don’t think it will be heightened simply because we’re taking part in the international coalition”. Will the threat not be heightened? 130 people were slaughtered by IS in Paris on 13 November after France extended its bombing against IS to Syria, as Britain is proposing to do. After Russia joined the international coalition against IS, 224 passengers in a Russian airliner were killed when IS brought it down. So, the UK is “already in the top tier of countries that ISIL is targeting”, according to the British intelligence services. This elevated status is due to the fact that the UK is already bombing IS in Iraq. Needless to say, David Cameron didn’t draw attention to this, lest MPs come to the obvious conclusion that the way to reduce the threat to Britain and British citizens abroad from IS is to cease bombing IS in Iraq. Unfortunately, that simple and cost effective alternative is ruled out by Britain’s aspirations to be a major power in the world. Being like Sweden is not an option for Britain. Instead, David Cameron says he is clear that “the only way to deal with that reality [of being in the top tier] is to address the threat we face”, the action being to bomb IS in Syria as well. This will inevitably make IS even more determined to strike Britain or British citizens abroad – and the proposed British contribution to bombing IS in Syria couldn’t possibly reduce their capability to strike in Britain or elsewhere. (This is a chilling echo of President Bush’s message to the American people when he launched “shock and awe” on Iraq in March 2003, on the false promise of eliminating al-Qaeda, which didn’t exist in Iraq at the time but came into existence as a result of the invasion, and in the fullness of time led to IS). Hancock is not alone in giving the impression that IS has a controlling “headquarters” in Syria – Raqqa is often mentioned – where it does all its plotting and, if only this “headquarters” were destroyed, the threat to Britain would diminish, if not vanish altogether. Assuming for one moment that there is an element of truth in this proposition, why does this “headquarters” still exist after more than 12 months of bombing by the US and others and how could a small British addition to the present array of airpower succeed where the US and others with far greater airpower have failed. In fact, the notion that IS has a “headquarters” in Raqqa, without which its functioning, including mounting terrorist attacks on Britain, would be seriously impaired, is nonsense. On the contrary, it is conceivable that IS would retain the ability to mount terrorist attacks in Britain and elsewhere, even if it were driven out of all the territory it currently controls in Syria and Iraq. Making Britain safer from IS attack requires the reduction of the resources – individuals, weapons and bomb making material – available to IS in Britain for terrorist purposes. Of course, those resources may be reduced by police action internally and at the borders, but the idea that extending bombing of IS from Iraq into Syria could have any impact at all on those resources is a fantasy. Yet that is what David Cameron seems to be saying. Indeed, it is difficult to see how the proposed military action by Britain in Syria would have any significant impact on IS in Syria, let alone on its resources in Britain. To the best of my knowledge, what is being proposed is that the aircraft and drones which are currently used for surveillance and bombing missions in Iraq and surveillance missions in Syria are going to be permitted to carry out bombing missions in Syria as well. The current missions are being carried out by a squadron of 8 Tornado fighter bombers based in Akrotiri in Cyprus (only 2 of which are in the air at any time) and 10 Reaper drones based in Kuwait. The squadron had originally been due to be disbanded in March 2015 but its life has been extended twice, first to March 2016 and now to March 2017. 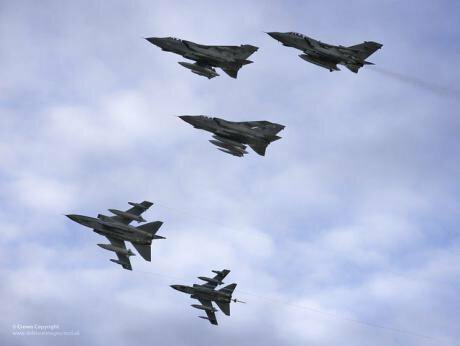 In December 2014, BBC Newsnight reported that “due to their age and long use” the Tornados require “long hours of work by ground crews, particularly on the engines” and that “on many days, just two or three of the Tornadoes are available for missions over Iraq”. That was a year ago. In September 2014, Britain joined the US and France in action against IS in Iraq (and they were later joined by Belgium, the Netherlands, Australia and Canada). Britain’s contribution has been small: measured in terms of airstrikes, out of a total of 5578 Britain was responsible for 381 (7%) and the US for 4026 (71%), as of 26 November 2015, according to airwars.com. In Syria, the US began operations against IS in September 2014, initially aided by Saudi Arabia, Jordan, the United Arab Emirates, Bahrain and Qatar. Canada followed in April 2015 and Australia and France in September 2015, but the vast bulk of the airstrikes have been carried out by the US. Since Paris was attacked on 13 November, France has greatly increased its airstrikes against IS in Syria and since early October, Russia has been giving air support to the Syrian government, attacking a range of rebel groups including IS. The plain fact is that if Britain extends its bombing to Syria, without increasing the resources being made available, its contribution will be small. He gave no further detail about who these “moderate” rebels are and where they are located in Syria. If David Cameron’s figure is to be believed, there are 70,000 Syrian “moderate” rebels that are ready, willing and able to fight IS. This begs the question: why did the Obama administration set aside half a billion dollars in June 2014 to train thousands of “moderate” rebels to retake Syrian territory from IS? The administration could have avoided setting up this training programme, which ended up in spectacular failure having trained 54 men in total, of whom only four or five ended up fighting IS, according to the head of US Central Command in evidence to the US Armed Services Committee.